A photojournalist jailed for doing his job. Two Associated Press veterans who were attacked. A reporter in Illinois facing fines and jail time for not revealing a source. A young scholarship student announcing he’s an undocumented immigrant. All these journalists - present and future - shared the common traits of courage, talent and perseverance. The National Press Club Journalism Awards Dinner on Wednesday, July 30, celebrated their accomplishments and some of the best journalism in the country in 2013. One of the evening’s highlights was a message from Ahmed Humaidan, a photojournalist from Bahrain in jail for his photos, who was overseas winner of the John Aubuchon Press Freedom Award. He was accused of attacking a police station, but was only photographing it at the time. He has been in jail since 2012 and was sentenced earlier this year to 10 more years in jail. “We, the photographers in Bahrain, worked very hard to deliver the truth as it is, without disguising or overstating the events we have witnessed,” Humaidan said in a statement read to the crowd at the Press Club by Nada Alwadi, a cofounder of the Bahraini Press Association. 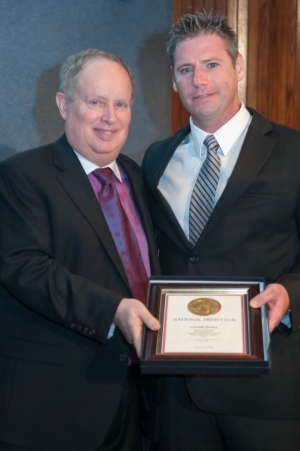 The U.S. winner of the Aubuchon Press Freedom Award was Joseph Hosey, a reporter for Patch.com, a national network of local news sites. He was held in contempt of court last year by a judge in Will County, Ill., who fined him $1,000, plus $300 a day for every day Hosey does not disclose the name of a confidential source who provided police reports about a double murder in Illinois. If Hosey loses the appeal, which is now pending, he faces indefinite jail time for not divulging the source. Hosey thanked the many people who have supported him since being held in contempt, and especially his attorney. Also at the dinner, NPC President Myron Belkind presented the President’s Award to the late Anja Niedringhaus, the Pulitzer Prize-winning photographer for The Associated Press, and her colleague AP reporter Kathy Gannon. Niedringhaus was killed in Afghanistan on April 4 in an attack that also wounded Gannon. The President’s Award is bestowed on special occasions by the club president with the approval of the Club’s Board of Governors. He noted that Gannon, who is from Canada, has covered the unrest in Afghanistan and Pakistan for The Associated Press for nearly three decades. And he quoted John Daniszewski, AP's vice president and senior managing editor for international news, about her expertise and dedication. "Kathy Gannon is a brave and passionate journalist whose expertise and deep knowledge and experience of both Afghanistan and Pakistan have made her an indispensable authority on the region,” according to Daniszewski. “Anja and Kathy had worked together repeatedly in Afghanistan since the 2001 U.S.-led invasion, often focusing on the war's impact on Afghan civilians,” Belkind said, with photos taken by Niedringhaus that captured the human side of war scrolling by steadily on the screen behind him. AP Political Editor David Scott accepted the awards on behalf of the wire service. The awards dinner intersected with a prominent policy debate in Washington - immigration - when the winner of the Club’s scholarship for journalism diversity announced that he is an undocumented immigrant. “I decided to make tonight my own sort of coming out story,” said Jose Valle, a graduate of First Flight High School in Kill Devil Hills, N.C.  Before his public announcement, Valle said that only his guidance counselor, one friend and his family knew about his immigration status. A North Carolina law requires undocumented immigrants to pay out-of-state tuition at the state’s colleges and universities. Unable to afford the University of North Carolina at Chapel Hill, Valle will start his post-secondary education at Durham Technical Community College. He said he hopes to transfer to UNC in a couple years. The club scholarship, which totals up to $10,000 over four years, will help him embark on his college path. The Club also presented the $5000 Richard G. Zimmerman Scholarship to Daniel Wetter of Roseville, Calif., and the $5,000 Dennis and Shirley Feldman Fellowship to Charles Andrew Eckert of Maspeth, N.Y. Wetter will attend George Washington University this fall to study political communications, while Eckert will be a graduate student at the Columbia University School of Journalism. The Press Club crowd gave Valle one of the longest standing ovations of the evening. And Valle’s speech lingered throughout the evening. Other award winners mentioned him when they were at the podium. “Thank you to Jose for speaking out and sharing his story,” said Tim Murphy, a reporter at Mother Jones, who won the Angele Gingras Humor Award. Jen Judson, a reporter with Inside the Army who won the Newsletter Journalism Award, said that she wants to see Valle return to the Club’s Awards dinner as a winner in one of the categories. “Jose, I hope to see you up here one day,” Judson said.